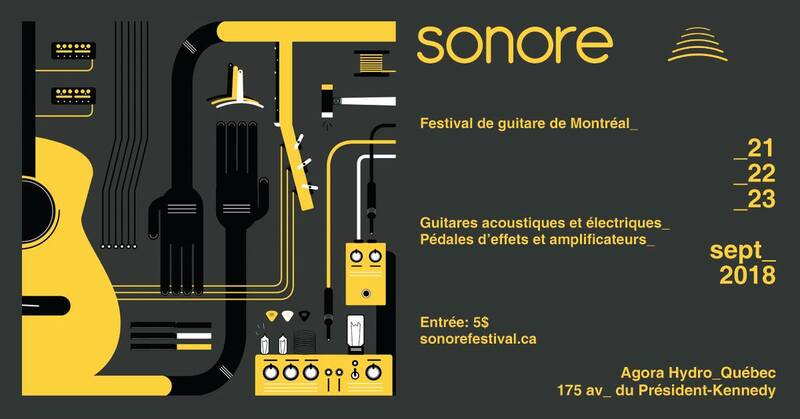 Au Festival SONORE à Montréal, j'exposerai quatre guitares acoustiques, dont deux, une Grand Concert et une Small Jumbo, sont faites entièrement de bois local. 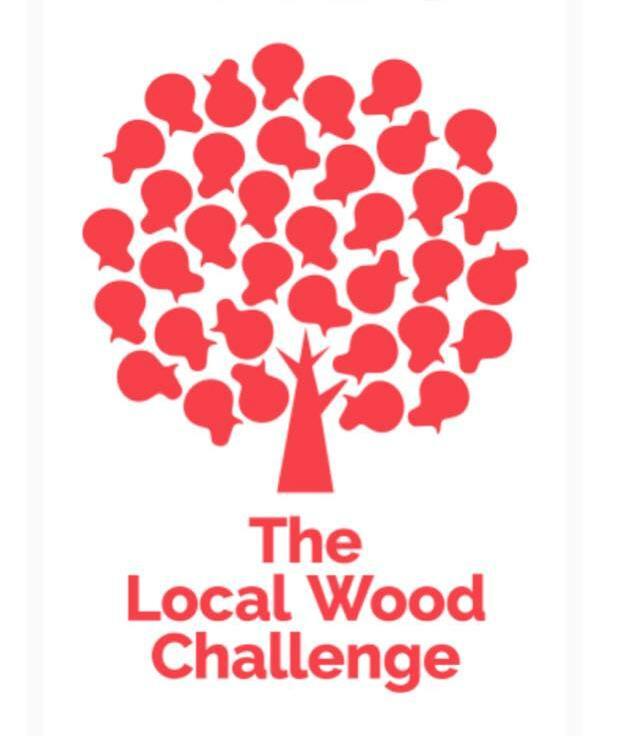 The Local Wood Challenge ("LWC") was originally conceived by the European Guitar Builders ("EGB") for the 2016 Holy Grail Guitar Show. For exhibitors who chose to participate, the idea was to build one or more instruments to exhibit at the show using woods local to their region. This enabled the exhibitor to do something outside the normal confines and expectations, giving them the freedom to explore new and different aspects of their work. As we know, the usage of many of our favorite tropical wood species has become more and more problematic over recent decades. Tropical woods are becoming scarce and are increasingly governed by restrictions on trade - see the recent CITES decision regarding all rosewoods. Climate change and environmental degradation will certainly further accelerate this trend. 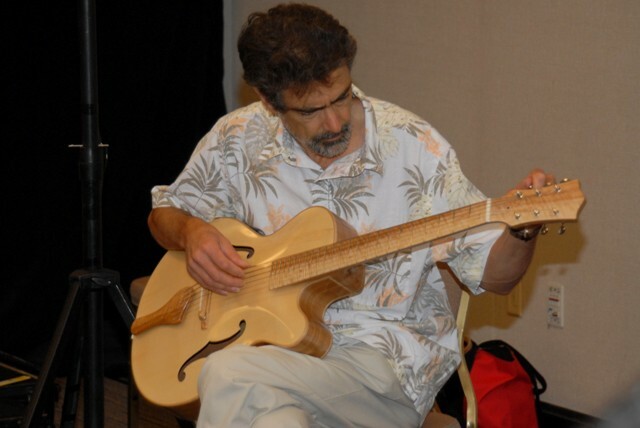 One mission of the EGB association is to draw attention to this issue and to educate the public about the fact that instruments built using local regional woods can be just as great-sounding and good-looking as instruments built with tropical woods. That is why the EGB has come up with the Local Wood Challenge. They want to highlight the fact that using only traditional tonewoods is not the only way to make a great guitar, and that sustainability has started to gain serious recognition as a seminal value. 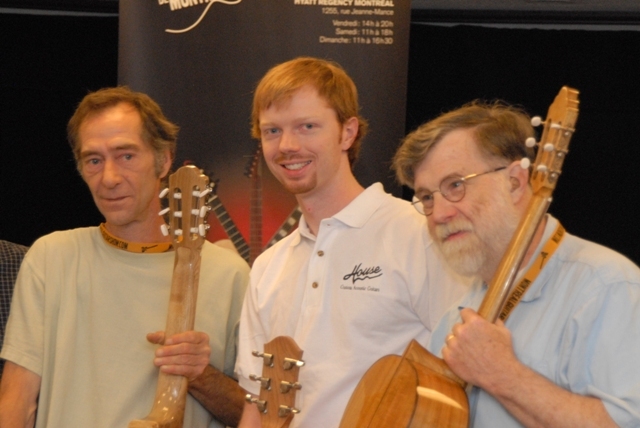 The instruments created as part of the Local Wood Challenge were presented to the media and the public at a special event during the 2016 Holy Grail Guitar Show. This turned out to be a huge success, and it immediately caught the imagination of the public as well as the media. The response was overwhelmingly positive, and media have now begun to feature the LWC in numerous articles, helping to focus attention on this important step towards sustainability. It is an idea whose time has come. 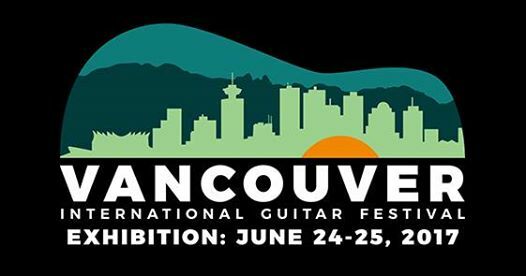 Je compterai parmi les exposants à cet important événement du monde de la guitare à Berlin en mai 2018! 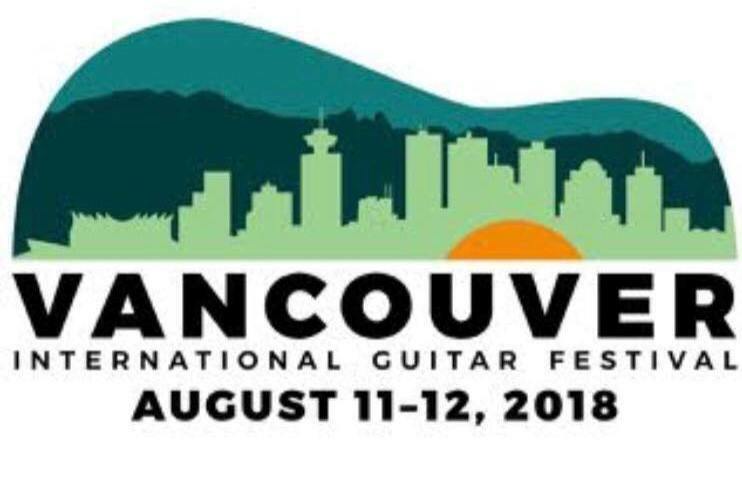 At the Montreal Guitar Festival I will be presenting three guitars and a ukulele with cherry back & sides and eastern red or white spruce tops. ﻿"The Cherry Seven Project"﻿ (below). I will be presenting four guitars with cherry back &sides, eastern red & white spruce tops, eastern hophornbeam fingerboards and cherry or butternut necks. The guitars presented are a Dreadnought, a Steel string fanfret fingerstyle Small jumbo, a Nylon string fanfret Classical/jazz guitar and an Archtop. In 2010, six luthiers from Canada and United States each built a unique instrument from the same wood furnished by myself: red spruce, cherry and Eastern hop hornbeam harvested in the Eastern Townships of Quebec. Those luthiers are: Jeremy Anderson, Alan Carruth, Joseph Hart, Josh House, Randy S. Muth and myself, Marc Saumier, who made two. 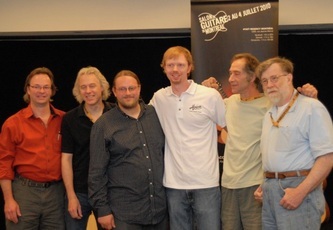 On July 3 2010, at the Montreal Guitar Show, we made a round table for media representatives and the day after, we held an open workshop during the guitar show itself. In 2009, Marc Saumier, a Canadian luthier who builds guitars exclusively from woods he cuts in nearby forests in the Eastern Townships of Quebec, had a bold idea: invite a group of luthiers to each build an instrument using wood from the same trees. In addition to Saumier, five other luthiers took part in the project—Randy Muth, Joshua House, Alan Carruth, Jeremy Anderson, and Joseph Hart. These six builders created seven instruments (Saumier contributed two) from red spruce, black cherry, and Eastern hop hornbean that Saumier sawed himself and provided to his fellow builders. Because each guitar features a cherrywood back and sides, the endeavor quickly became known as the Cherry Seven Project. Exhibited as a collection at this year’s show, the seven guitars attracted a lot of attention for their sonic appeal and visual beauty. 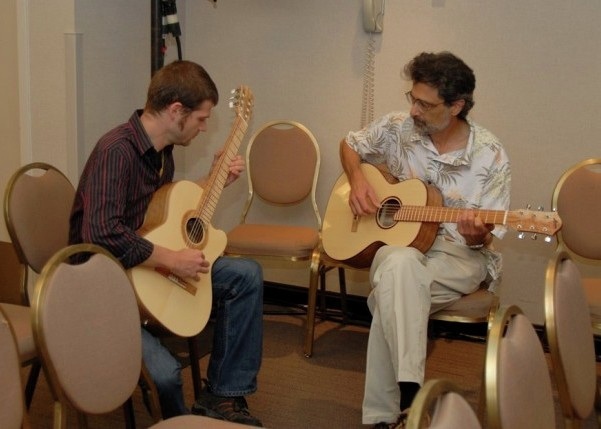 Though the woods used in these acoustics came from the same logs, each guitar emerged from its respective workshop with a unique look and sound, proving it’s a luthier’s hands—not the materials he uses—that ultimately determines an instrument’s character.